The site of the Chesterfield “mansion party” murders. Photo courtesy of WTVR. The man accused of hosting a deadly “mansion party” in Virginia and then fleeing to San Luis Obispo County where he was involved in a shootout has been cleared of charges on the Central Coast. However, he will likely now be extradited to Virginia. One year ago, Karheem Graham-Lutchman was allegedly promoting his Virginia “mansion party” on Instagram. 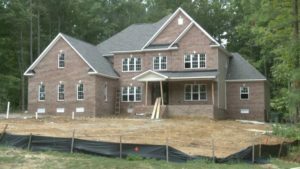 In Virginia, gang members break into homes under construction, advertise their “mansion party” on social media, and then often charge admission, Chesterfield, Virginia police said. Graham-Lutcham’s Instagram advertisement went viral, and on Sept. 4, more than 300 people showed up the party at a home still under construction in the upscale community of Chesdin Landing. During the drug fueled event, more than 70 shots were fired from seven guns leaving two men dead and a third man injured, police said. Following the event, Chesterfield police arrested seven alleged gang members suspected of firing shots during the mansion party. Six were charged with second-degree murder. On Nov. 30, Graham-Lutchman and Jaquan Jabriel Burns, also from Virginia, attempted to crash a gathering on Whispering Oak Way in rural Paso Robles. When a man opened the door, a fight ensued, and there was an exchange of gunfire. Burns, Graham-Lutchman and the man who opened the door each suffered gunshot wounds. Investigators, at least initially, said the shootout was believed to be drug related. After the gun battle, Graham-Lutchman and Burns transported themselves to a local hospital where Graham-Lutchman falsely identified himself as Fred Allen Cooper III, according to the SLO County Sheriff’s Office. At the hospital, Burns was treated for a gunshot wound to his leg, and Graham-Lutchman was treated for five gunshot wounds to his legs and arms. Following the suspects’ release from the hospital, deputies booked them into the SLO County Jail on attempted murder charges. Prosecutors later filed charges of attempted murder and robbery against Graham-Lutchman and Burns. Burns, though, pleaded no contest. He is expected to receive an eight-year prison sentence as part of his plea agreement. Authorities in Virginia have requested Graham-Lutchman’s extradition. Neither of the Virginia men are currently in SLO County Jail, according to the sheriff’s office website. Was Virginia slow in requesting extradition? If not, why is this dude not back in jail? What the hell did this article even say? SLO County is taxing illegal house parties in Virginia? If they build it they will come. So while the politicians promote excessive growth let the parties begin. I guess it’s out with our small town atmosphere and bring on the big time so that they can tax it.